A former President of the Nigeria Bar Association (NBA), Dr. Olisa Agbakoba, has sued the Federal Government over the ministerial position of President Muhammadu Buhari. 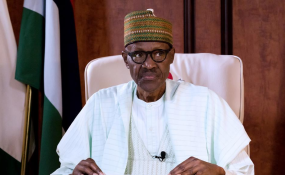 The suit at the Federal High Court, Abuja is seeking an interpretation of the constitutional qualification of the president to simultaneously hold executive office as minister of petroleum resources. According to Agbakoba, Section 138 of the Constitution disqualifies the president from taking any paid employment or holding executive office such as the Minister of Petroleum Resources. In a 14-paragraph affidavit to support his claim, he stated: "I am greatly concerned about the recent management crisis in the Nigerian National Petroleum Corporation (NNPC), particularly the disagreements between the Minister of State, Dr. Ibe Kachukwu and the Group Managing Director, Dr. Maikanti Baru. "I verily believe that the governance chaos in the NNPC could not have occurred, if the president is not also the minister of petroleum resources. I am aware that the NNPC provides up to 90 percent of the revenue accruing to Nigeria. "I am worried that the crisis would greatly reduce the country's revenue generating capacity and affect the revenue distributable to the federal, state and local governments." He stressed that it would gravely affect some developments in the country and "drastically impact all Nigerians, including those in Anambra state, my state of origin and Lagos state, my state of residence. "The President of Nigeria, who is also the Federal Minister of Petroleum Resources, discharges executive responsibilities as member of the Federal Executive Council (FEC) of Nigeria, under Section 148(1) & (2) of the 1999 Constitution. For this reason I believe that the minister of petroleum resources is an executive office," he said. Agbakoba is praying the court to disqualify the president from holding the office, adding that by virtue of Section147 (2) of the 1999 Constitution, the president purporting to hold the office of the minister cannot lawfully do so without confirmation by the Senate of the National Assembly.